“Not by much”? Funny, that’s never been used when another automakers vehicle is rated better then a GM vehicle in some category! Is this website hanging onto its integrity? Same price premium over the 5.3 that the 6.2 is. Going to be a tough decision for people to make. Especially with common diesel prices in the US close to the 91 octane price that 6.2 needs. At least in Canada diesel is usually cheaper than even 87 octane. 5.3 RST with custom PCM/TCM tune is still what i would go for. ANDREW, what’s with you? You know little about diesel fuel prices in Canada. Each city and market area is different. I suggest you go to the website Gasbuddy dot com to get the real hour by hour fuel prices for both gasoline and diesel fuel. For example, in London, Ontario, the price of diesel is more than gasoline today as off 2:30 PM today, but in Toronto, up until this past week, diesel was more than gasoline prices. That all changes next week. Remember the Justin Trudeau carbon tax starts on April Fool’s Day in Canada and the extra cost at the pump will be 5.99 cents per liter including the 13 percent HST for diesel fuel. The Trudeau carbon tax is bit lower by about 1.5 cents for gasoline including the HST. The 6.2 doesnt need 91. It can run on 87 octane. Where i live, 87 is about $1.00 less per gallon than diesel. I have a 2018 Yukon with the 6.2 engine,..it is an awesome powerplant, but it requires 91+ octane. I’ve tried 87 in a pinch, but I could hear a knock under heavy acceleration. I don’t believe the 2019s can be tuned yet, to tune a 2017-2018 tcm (8 speeds) require far greater costs and effort than most will deem worthwhile. Why is it not available in the LT Trailboss? I see this going into the refreshed Colorado and Canyon and should go into the full size 1/2 ton SUV’s and cargo vans. LT Trail Boss: priced $6k-ish more than the LT and $4k-ish more than the RST, but doesn’t get the Duramax. WHY does the really cool “aggressive off road” trim not get more power? The “Rally Sport Truck” should be getting the 6.2 as well if we’re talking trim levels again. Complaints aside, I’m still excited for this engine. Fingers crossed the Tahoe and Burb get it right off the bat! No chance Tahoe and burb get it right away. GMC AT4 gets this engine and it’s pretty much the same as LT Trail Boss. Maybe GMC wanted something unique? Haha! Look at the sore losers with their aluminum head weak fake diesel! The Duramax has had aluminum heads since the original lb7, hasnt been an issue. In 2001 We bought a new gmc 2500 HD duramax which we still have and has been a wonderful engine except for all new injectors replaced under warranty. Still runs like brand new and with those nasty aluminum heads , it just passed 503000 kilometres. Yep, that’s what the Ford guys used to say, and then they decided that the Duramax was right and used aluminum heads when they made their own Powerstroke. Ah, but I don’t have a POS blow-up Ford diesel. I have a real Diesel, one without weak aluminum heads, a Cummins 6.7. Remember you and your GM guys all say aluminum is too weak for a truck bed, so it sure as hell is too weak to be used for a diesel head, no question about it. Google it- tons of GM an Ford guys with alum head problems. If GM would please pair this little beauty to a 6 speed manual transmission and plop it into a Colorado/Canyon I’d happily go into a dealership and start signing papers tomorrow! Hey Hugh, I was thinking that all three make the diesels with aluminum heads. Might be wrong. You are wrong- the 6.7 Cummins in the RAM is all iron. There may be some baby 3.0 Cummins made for baby trucks that has some aluminum. FINALLY!! We should have been able to buy diesel powered 1/2 tons long before now!! finally I agree! I have waited a long time to own a Chevrolet truck like this. I currently own two Mercedes diesel 3L sedans. Sprinter vans have had diesels for 14 year plus. The duramax 6.6L is a beast of a truck that I owned a in a LBZ. That truck with 37’s new turbo proper supporting mods was insane and got good fuel mileage. Although I wanted a smaller truck with a diesel to just out stupid miles and wear out. Although I wanted a good manual 4×4. Now the autos are gone and really this diesel in my opinion is too late. Electric trucks are coming fast and far more capable. Still no manuals in the future though. So let me guess, tomorrow Ford will probaby have a software update to theirs and offer it to the ones already out to 278 hp and 461 lb-ft, so they have the best numbers on paper again. Looks like a great engine. Many of us don’t need a 6.7, 7.3 or Godzilla liter engine for everyday use. This almost hits the sweet spot for me. I wish one of the big three would come out with a 4.0 liter 385hp with 550 lbs of torque. Throw in 1800 lb payload and 8500 lbs towing and I’m good. 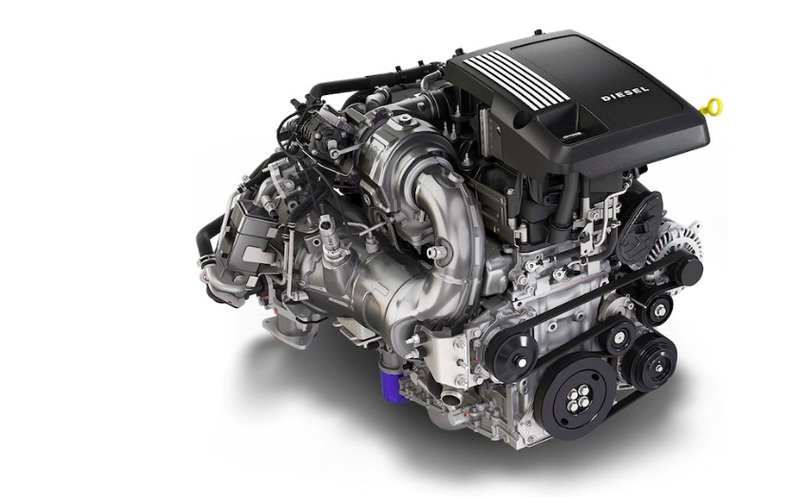 To put it in perspective, this 3 liter only makes 23 less HP and 60 ft-lbs less torque than the original LB7 6.6 liter Duramax (with its excellent aluminum heads thank you). Those are pretty stout numbers for a half ton that should knock down close to 30 mpg on the highway. Looking forward to seeing the economy numbers when published.